In this final installment of our serialized review of The Misunderstood Jew: The Church and the Scandal of the Jewish Jesus, we examine Amy-Jill Levine’s last three chapters and Epilogue. Here she continues to demonstrate the intelligence, scholarship, wit and fairness we have admired all along. It has been a demanding and rewarding journey. Chapter Five, “With Friends Like These,” considers how the Christian academy and professional guild have perpetuated untrue and damaging stereotypes, serving to institutionalize within the church and its people the errors chronicled in the book’s previous chapters. As a rule, Christian education and preaching have outlined and defined what exemplary behavior and ethics look like through making odious comparisons with the Jewish people and their religion. Liberation theology uses biblical templates of deliverance from oppression to inspire hope and structure action for labeling, resisting, and overturning perceived systemic social and economic evils in contemporary society. “The focus becomes not sacraments and soteriology but empire and economics.” Looking to the New Testament for paradigms, Liberation Theology focuses not on deliverance from the oppression of Imperial Rome, but rather, from the alleged systemic evils of Judaism and its religious hierarchy. From the writings of iconic Liberation theologians Levine extracts horrifying stigmatizing portrayals of the Jews and their religion. It is no doubt a sign of progress that two generations ago such statements would have evoked fear in persons like me: today they evoke rage. Even though institutions like the World Council of Churches issue statements and position papers standing against anti-Semitism and anti-Judaism, the Christian habit of seeing Judaism as the foil of purer and liberating Christianity guarantees a continued flow of Judaism negating rhetoric. Levine can only touch upon an issue deserving a book of its own: how the “Christianity Yes-Judaism No” rhetoric of Liberation Theology has become the lens through which the Israel-Palestine situation is seen and interpreted. So it is that poor in the gospels become the Palestinians, and the oppressors are the Jewish religious officials and their religion. Stereotypical caricatures of Judaism serve as a handy counterpoint to the contemporary quest to stamp out misogyny and taboo-ridden prejudices of all kinds. Modern preachers and Christian educators position Jesus and themselves as in sharp contrast to the “misogynistic rabbis and religion” of his time, presenting him as indeed, “The only rabbi who did not discriminate against the women of his time.” Such educators and pastors misunderstand and misrepresent Jewish purity laws as just another means of shaming and marginalizing women, such that, “to continue to exclude women from certain Christian ministries on the basis of outmoded Jewish taboos is to render no and void deliberation the Jesus one for us.” Levine is masterful and concise in giving her readers a crash course in what Jewish purity laws were really about, refuting point for point the sweeping and false generalizations that form the grist for anti-Judaic Christian rhetoric. Barbel von Wartenberg-Potter, Director of the Women’s Department of the WCC writes that Judaism has a “narrow ethnic, racist understanding of election.” Even so vaunted an icon as N. T. Wright, holds that discarded Christ-rejecting Israel pursues its preoccupation with “relentless pursuit of national, ethnic and territorial identity.” While Christians may see Judaism to be chauvinistic and narrow, they give no second thought to the Christian doctrine that only those who believe in their Christ will be saved. Judaism is far less soteriologically and missiologically narrow than is the church. Yet it is the church which has made axiomatic the alleged narrowness of Judaism. These are just some of the quotations she musters to demonstrates the pathology of Christian perceptions and portrayals of Judaism. Marcion of Sinope was a second century bishop who held that the God of the Old Testament was a different God from that of the New, and that the Scriptures of the Church needed to be separate and divorced from those that the Jews venerated. Following in the train of Marcion, one will have no difficulty finding Christian sources claiming that Judaism does not worship the Christian God who alone is the True God. The God of Christendom is contrasted with the [lower case]god of Judaism. So that Kowk Pui-Lan, of the Episcopal Divinity School in Cambridge, MA, speaks of how “God cried out from the cross” and the one who “suffered under the oppressive Jewish tradition.” Others are no less strident in their disqualifying the God of the Jews from the true God. Reverend Louise Kumandjek speaks of how “Jesus died as the result of the clash between his God [capital G] and the god [lowercase g] of Pharisiaic Judaism.” The further material Levine quotes from Reverend Kumandjek is no less offensive and alarming, not only because of its strident anti-Judaism, but also because the language severs the gospel from its Jewish context, and the Jewish people from the Living God. But this is not the only separation evident in common “enlightened” Christian rhetoric. Jesus is also severed from the Jewish people, made to be a stranger to and enemy of Jewish religion, and then dressed in the garb of a Palestinian. The Jews lose God, their religion becomes categorically false, and the Jews lose Yeshua the Messiah too. Instead, the Palestinian community, under the propagandistic sway of contemporary leaders reinvents the King of the Jews as “Jesus Christ, living in our country as a Palestinian under occupation,” with Israel having placed “a large bounder, a big stone that has metaphorically shout off the Palestinians in a tomb. Levine concludes the chapter by examining the causes for the dire and Judenrein scenario of which this chapter speaks. First, the two-thirds world is infected with the anti-Judaism, and the post-Jewish gospel brought them by the missionaries. And they have learned their lessons well. Second, for some of the authors, “Jews are not real people.” They don’t know any real Jews, their concept of the Jews is cobbled together from a few proof texts and proddings from a generally post-Judaiac and yes, anti-Judaic Christian tradition. “Third, anti-Jewish, Marcionistic, and just plain unhelpful comments appear in almost all aspects of Christian liberation-theological education.” And theologians, textual scholars, and their students live in such a self-referential world that they have no clue that their perceptions and portrayals are false and destructive of the context that the life and message of Jesus meaning. Fifth, the gatekeepers and editors of Christian academia deny that there is a problem, and attribute Jewish alarm to personality problems on the part of those who complain of anti-Judaic stereotypes. These prejudices are not idiosyncratic; they are systemic and they are global. They begin in the academic classroom and the Sunday School, they are passed along to pastors and priests, and they are taught to congregations under the label of justice, compassion, respect. In her sixth chapter, “Distinct Canons, Distinct Practices,” she insists that Jews and Christians read the Bible with different collections and orders of books [the canon], and with different presuppositions in place, and that each community needs to allow the other to read in keeping with their own assumptions and canons. She calls for mutual respect rather than common ground. This is a somewhat “you go to your church, and I’ll go to mine” perspective. Yes, she is willing to allow that both traditions are hearing from the same God, that both see and hear in part, and that both could learn from the other. She calls upon both Jews and Christians to allow that the traditions toward which they have long contrasted themselves are part of a bigger Divine picture that deserves to be seen and honored. 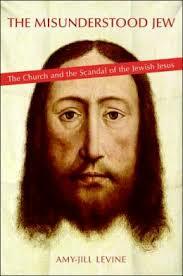 In our day, many authors, whether Jewish, Christian, or Messianic, are writing about the Jewish Jesus. In no case should or will any of us agree one hundred percent with everything we read, because opinions and ways of expressing these opinions necessarily differ. However, one will have to look long and hard to find a treatment that covers as much ground as does Levine, and so well. She really did her homework, and a lot of ours as well. We can only say, todah rabbah – Thank you very much.